« A Once in a Lifetime capture. The Vulture Multi-species Action Plan (Vulture MsAP), approved recently in the conference of the parties of the Convention for Migratory Species – a global strategic blueprint identifying priorities and actions to conserve 15 species of old world vultures – says it clearly: (illegal) poison with poisoned baits (often against predators of livestock) is the main threat to vultures worldwide. In the last few months we have reported several times dramatic episodes of poisoning affecting mostly African vultures, in what is already known as the African vulture crisis, leading to several species being considered critically endangered. But the illegal use of poison still occurs in Europe too – in spite of the multiple projects, awareness campaigns, strict enforcement and even tough penalties. 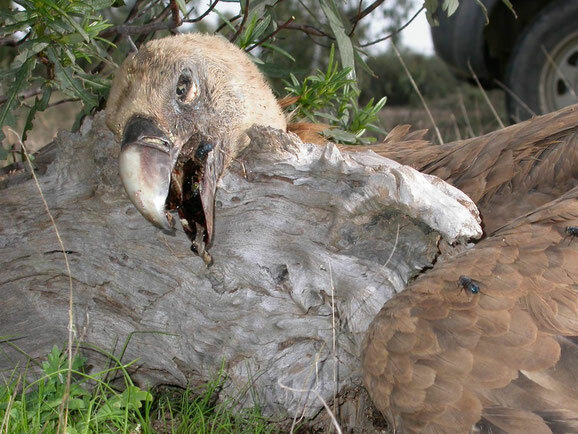 News of a grave poisoning incident in the Sierra de Zamarraya in the province of Granada (Spain) resurfaced recently: in late September a local enforcement agent had found the bodies of 15 griffon vultures. Now, the regional Minister of Environment and Planning in Andalucia, José Fiscal, confirmed the suspected poisoning, and announced that a thorough investigation is being conducted – he accused those using poison baits as “environmental terrorists”. Andalusia, where the VCF is supporting the bearded vulture reintroduction project, has some of the best anti-poison programmes in Spain and in the world, and has announced recently more investment and work against this threat, after 3 bearded vultures were found poisoned to death there last year (2016). The Junta de Andalusia launched some months ago a new “Andalusian Pact Against poisoning”, which is now being negotiated with the different stakeholders, and had previously announced an extra 100,000€+ in investment, with the hiring of two new staff members and a new canine dog this year to fight this threat, to add to the existing structure. The Vulture MsAP recommends a number of actions to fight this threat, a multiple-pronged strategy involving improving the knowledge about the use of poisons (impact, drivers for the use, and capacity for accurate analyses of products and corpses), the all-important awareness campaigns, an emphasis on enforcement, and work with the legal and judiciary bodies to arrive at condemnations to those who do these crimes, usually left unpunished.